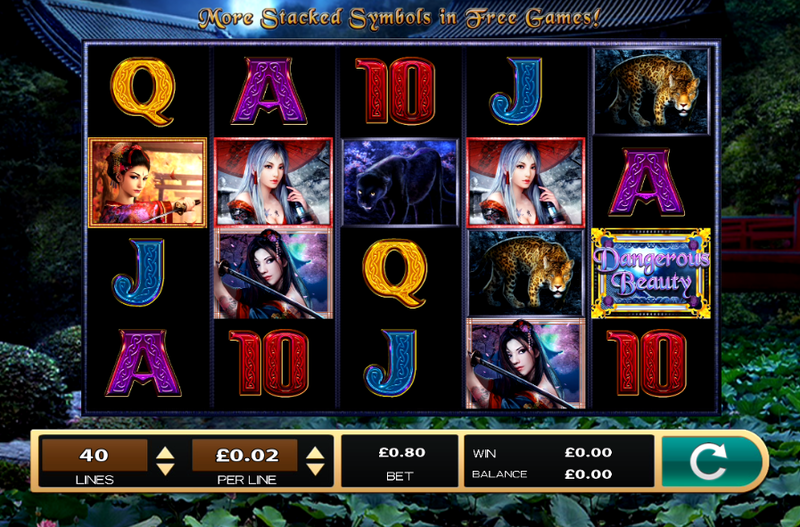 Dangerous Beauty is an online slots game from High 5 Games, based around a Japanese theme. The main narrative around the game involves three female Samurai warriors, each of whom has slightly different warrior attributes. The slotsbaby game uses five reels and three rows, and offers players 40 paylines, and the Return to Player ratio is 94.9 percent. With plenty of fun features and great graphics on show, this is a highly enjoyable game for anyone who enjoys playing slots online. The symbols on Dangerous Beauty’s five reels reflect the exotic, glamorous Japanese theme of the game. You can find panthers, tigers and playing cards, as well as the three beautiful Samurai women who are the main characters. Japanese sounding music helps to immerse you in the game’s oriental mysteries, and gameplay is smooth and slick. The game’s wild symbol is a stormy, moonlit sky, with the game’s logo superimposed upon it. If you manage to spin in five wild symbols on a payline, you will receive 1000 coins as a prize. The scatter symbol is a green dragon, which only appears on the second, third and fourth reel of the five used in the game. If you collect three green dragon symbols on a spin, then you are awarded seven free spins. This green dragon symbol is the only symbol that the game’s wild cannot replace. The best way to take home big wins in this game is to stack up symbols. All game symbols can be stacked, which opens up real possibilities for significant wins. Super stacks can be found not just in the free spins feature, but also during regular gameplay. Play today here at SBaby! Founded in 1995, High 5 Games has established a reputation as a purveyor of high-quality online entertainment. Over its 24-year existence, it has established offices in over 50 countries around the world, and now has over 300 games in its catalogue. The company is particularly well known for two titles that were published in 2011. These were Black Widow and Golden Goddess, two games which really cemented High 5’s reputation for quality. High 5 has also managed to win awards for its games. In 2016, they won the Electronic Gaming Review award for North America’s Best New Game. In 2015, they were named as the fastest growing online casino on Facebook. If you like playing on fruit machines you are sure to enjoy Dangerous Beauty. As well as offering some great features, such as the super stacks feature, you can also enjoy the Japanese atmosphere created by the game’s excellent graphics and music. With a huge payout available for a five-of-a-kind wild symbol win, you should also find plenty of excitement and thrills when playing this game. Look out for Dangerous Beauty in your favourite online UK casino. Follow this link to read more.